England's World Cup-winning rugby team are set for a heroes' welcome when they return from Australia on Tuesday. The squad - flying in a plane rechristened "Sweet Chariot" in their honour - left Australia on flight BA 16 at 0520 GMT and are expected to arrive at Heathrow airport at 0430 GMT on Tuesday. A separate seat was reserved for the William Webb Ellis Trophy, while extra crates of beer were ordered. Jonny Wilkinson kicked England to a 20-17 victory with a drop goal just 26 seconds from the end of extra-time in a scintillating final on Saturday. England coach Clive Woodward said that, with his phone blocked by so many goodwill text and phone messages, he had not received a message to call Downing Street "so apologies to the prime minister for that". Downing Street is discussing plans for an official celebration to mark the triumph. A spokesman said: "We have been talking to the RFU to see how we could mark their efforts. A reception is obviously one of the things we are talking to them about." There is speculation Mr Woodward could be knighted after guiding the team to its first World Cup victory and the first global success for a major British sports team since 1966. Although Woodward and the captain Martin Johnson were careful to praise the whole team, the media has heaped much of the credit on to the 24-year-old shoulders of Wilkinson. PR guru Max Clifford said Wilkinson can now expect the same sort of hero worship as David Beckham and could earn up to £5m a year. Mr Clifford said: "He's the golden boy of rugby. He's been such a success during the World Cup so the sky's the limit." But Wilkinson's mother Philippa, who went shopping during the game because she was so nervous, refused to highlight her son as the hero. She said: "I am pleased for the whole team. You can't just say it's the one boy, it's the whole team." A Buckingham Palace spokeswoman said: "The Queen has sent a message to Clive Woodward congratulating the team on a great victory." 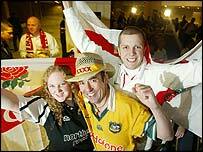 Tony Blair said: "This was a fantastic day for English rugby and for England. Beckham, who became friends with Wilkinson when shooting an advert with him, missed the game because he was training in Spain with Real Madrid. He said: "It was a very proud day for England. I said during the week that I felt that England would win and Jonny really deserves what happened today. "Congratulations go to the whole team on behalf of the England football team." England football coach Sven-Goran Eriksson paid tribute to the team and said he hoped to repeat their success at the European Championships next year. Conservative leader Michael Howard also congratulated the team and said: "The pride sends shivers down your spine. 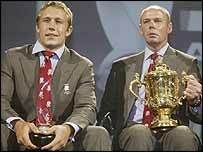 "Every player did his bit, but Clive Woodward stands out above all. He was written off four years ago and he has made England world champions." Tessa Jowell, Secretary of State for Culture, Media and Sport, who was at the game, added: "This is a piece of history and I am absolutely thrilled."